On the journey Katie finds friends and a new faith but it is in a distant land that her faith will face its greatest challenge. Will she stand the test? 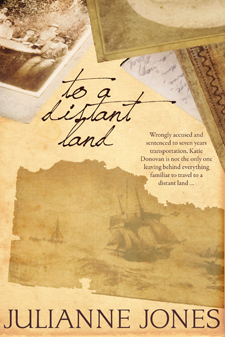 Samuel McKinnon accepts a position as spiritual advisor on a convict ship, intending to return home once the journey is complete but he soon discovers that God's plans are contrary to his own. Will he have the courage to step into the unknown and trust God to direct his steps? Rhiannon Sanford immigrates with her family to Australia after a rift between her grandfather and father forces the family to leave everything behind. Her father's dream of a new life will require sacrifice and challenge. Will the price be too great? To purchase the printed book version, visit Ark House Press. Julianne Jones is a Christian author passionate about sharing God's love via the written word. A wife, mother of five, grandmother, and early childhood teacher, Julianne divides her time between family, writing, and teaching. Born and raised in the beautiful Hunter Valley of New South Wales, Julianne and her husband now make their home in New Zealand.